Of course you’ve heard about the colorful leaves, and perhaps you’ve seen pictures of the charming lighthouses, and maybe you’ve even tasted the lobster – but you haven’t really experienced Canada and New England until you’ve cruised through this magnificent region of North America and seen it for yourself! Words can’t describe the rush of standing against the wind atop a rugged cliff while watching the waves battering against the rocks below. Or the feeling in your heart when you catch that first glimpse of the New York skyline and Statue of Liberty, her torch glimmering in the sun. And imagine the smile on your loved one’s face when they slurp a juicy raw oyster fresh from the sea! Even the history that used to put you to sleep in grade school now comes to life – echoed in the sites of events that shaped Canada, the United States and beyond. You’ll experience all of this and more when you cruise to Canada and New England. Canada and New England cruise itineraries come in all lengths – from 5-night getaways to multi-week voyages – offering something for all types of travelers on any budget. Our wide range of itineraries travel northbound, southbound and roundtrip while departing from several different ports – such as Boston, Cape Liberty, Montreal, New York City, Quebec City and others. Cruises to Canada and New England are available throughout the summer months, but the most popular time to visit is during September and October when the fall foliage is at its most vibrant. Imagine touring the winding coastal roads and trails of Canada and New England with a refreshing autumn breeze at your back and a charming fishing village or historic lighthouse on the horizon – all set to a waving backdrop of bright reds, oranges and yellows! Just remember, the peak cruising season is relatively short and the limited number of itineraries sell out quickly, so it’s best to book early. Halifax is a lively town with a bustling downtown harbor and plenty to explore in the way of shops, restaurants and parks. The Halifax Public Gardens are perfect for a relaxing stroll, while the nearby vineyards invite you to sample their wines and mingle with the locals. To dive into Halifax’s fascinating history, check out the Canadian Museum of Immigration at Pier 21 or tour the Halifax Citadel where you’ll spy engaging historical re-enactors in their period attire. Sydney will provide cruisers with some of the most striking views, especially those overlooking the inland sea of Bras D’or Lake. We highly recommend taking a bicycle or driving tour along Cabot Trail, which stretches around Cape Breton’s Highlands National Park just north of Sydney – the views here will take your breath away. Step back in time with a visit to the one-time home of Alexander Graham Bell – inventor of the telephone – or go even further back to the 1700s at the Fortress of Louisbourg National Historic site. Located on Canada’s smallest province, Charlottetown is the epitome of charm. This is the area that inspired Lucy Maud Montgomery’s Anne of Green Gables, and where you’ll find a museum dedicated to the author and her work. At one point Anne excitedly exclaims, “I’m so glad I live in a world where there are Octobers,” – and we’re sure you’ll agree when you have the privilege of visiting Charlottetown in the fall. Surrounded by the sea, you’d be remiss not to enjoy its delicious bounty – especially the fresh oysters and mussels. If you’re feeling adventurous, rent a kayak to explore the scenic coastline, keeping your eyes peeled for sea and wildlife such as the harbour and grey seals which can be seen year-round. Rising from the banks of the St. Lawrence River, Quebec City features a fascinating Old Town district complemented by the surrounding natural beauty. The thundering Montmorency Falls (which are taller than Niagara Falls) are located just outside of Quebec City and make for the perfect stop after a morning of touring the city’s exquisite churches, such as the Jesuit Chapel, Sanctuaire Notre-Dame-du-Sacre-Coeur and the Basilique Cathedrale Notre-Dame de Quebec. And you certainly can’t miss the Chateau Frontenac, one of the city’s most famous landmarks, and arguably the most beautiful. Known as “Canada’s Cultural Capital,” Montreal is home to a flourishing art scene which has produced many notable music, theater, dance and visual artists over the years – the collections of whom you can peruse at the Montreal Museum of Fine Arts. For a panoramic view of downtown Montreal, take a hike to the top of Mount Royal. To refuel after your hike, you’ll find no shortage of tasty dining venues nestled amongst the historic buildings below. You’ll be delighted by Saint John’s Victorian-inspired architecture and mesmerized by the Bay of Fundy’s dramatic tides – the highest in the world. These persistent tides have formed unique rock formations like the Hopewell Rocks, which you can explore by foot on the seafloor when the tide is out, or kayak around during high tide. Head downtown to the Saint John City Market to learn about the town’s maritime roots, walk across a rustic covered bridge or practice your birding and whale watching skills. Looking to explore other, less visited Canadian cities? Select Canada and New England cruises will take guests to hidden gems such as Corner Brook, Gaspe, Saguenay Fjord, St. John’s and others. Plus, beyond the Canadian ports featured above, many cruises to Canada also call in classic New England cities like Bar Harbor, Boston, New York City, Newport and Portland – each full of rich history and a wide range of attractions. Bar Harbor, for instance, is your gateway to Maine’s Acadia National Park and its scenic trails. You could also tour The Breakers Mansion in Newport, Rhode Island for a dazzling display of Gilded Age extravagance, or visit Portland Head Lighthouse, nestled along Maine’s rocky coast. Boston’s Freedom Trail beckons you to explore more than a dozen Revolutionary War sites, and New York City needs no introduction – just the willingness to wander and try something new. Either as a departure port or a mid-cruise stop, none of these US cities is to be overlooked. 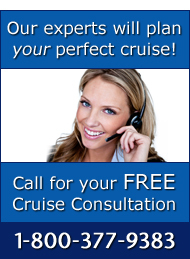 To learn more about cruising to Canada and New England, or to explore available itineraries, contact The Cruise Web’s travel experts at 1-800-377-9383. Have you ever traveled to Canada or New England? What were your highlights and most memorable experiences?